There is some confusion about the word 'allergy'. It comes from the Greek 'allergos' which simply means an altered reaction, so it is in this sense that I use the word. Allergies are on the increase world wide. They can cause quite serious illness if not dealt with early on. The contemporary assault on the human immune system is unprecedented in human history. It begins very early with a series of immunization and vaccination cocktails on very immature and still developing immune systems. The load of heavy metals and chemicals in the environment is now such that we have hundreds of them in our blood stream. Added to this is the often indiscriminate use of antibiotics, the overuse of antibacterial cleaning agents and the processing of much of our food. During therapy all of these issues are addressed. Sometimes a single remedy may be sufficient to switch off the reaction but often it can take longer for the immune system to be rebalanced and strengthened. 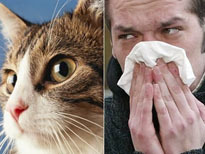 Leaving allergies in place is not a good idea as they can open the way to more serious auto-immune problems. These are also on the increase. Allergies can affect any part of the body including the digestive system, the joints and the brain, and can make life very uncomfortable indeed. It is possible to remedy the situation but a degree of commitment and hard work will be required from the client. But persistence does pay off in my experience and improved health is a priceless reward.